Home / MLB Playoffs / So yeah, that sucked. It was an unbelievable day of baseball – but the wrong kind of unbelievable. I’m not sure there’s been a more shocking, stunning day from start to finish in the history of the MLB postseason. Clayton Kershaw had one of the worst innings in baseball history today. 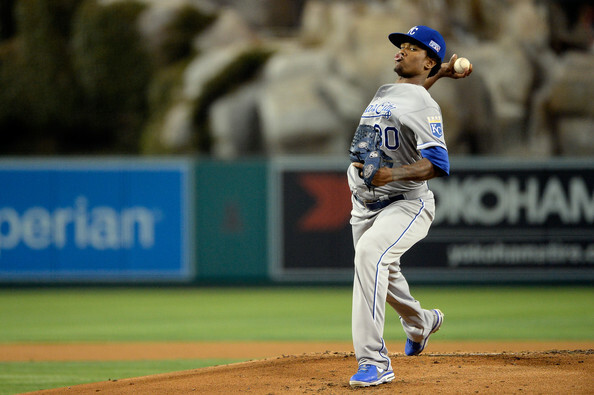 Capped off with another stunner in Anaheim, aided by a dominant outing from Yordano Ventura (pictured above, the world will know him now); today saw three home teams lose and a fourth come from a huge late deficit to beat an arguable favorite. And not ONE single game has had the outcome we desired since the wildcard games took place at the beginning of the week. Not one. We wanted an LCS of Detroit/Anaheim and Los Angeles/Washington. All of those teams are in the hole or on the brink of elimination – Anaheim is done, Detroit could dig out of a two game hole we feel. And tomorrow, Los Angeles and Washington’s seasons are on the line. New stars are being born right now. Eric Hosmer, Joe Panik, Yordano Ventura; these are just a few of the guys who are rising up in the world like a regular Tony Montana. Tomorrow is a new day. Today once again showed how intense baseball can be, how cruel of a game it is, and that sometimes things simply aren’t going to go your way no matter how bad you want it.